Last major update issued on January 21, 2012 at 06:10 UTC. 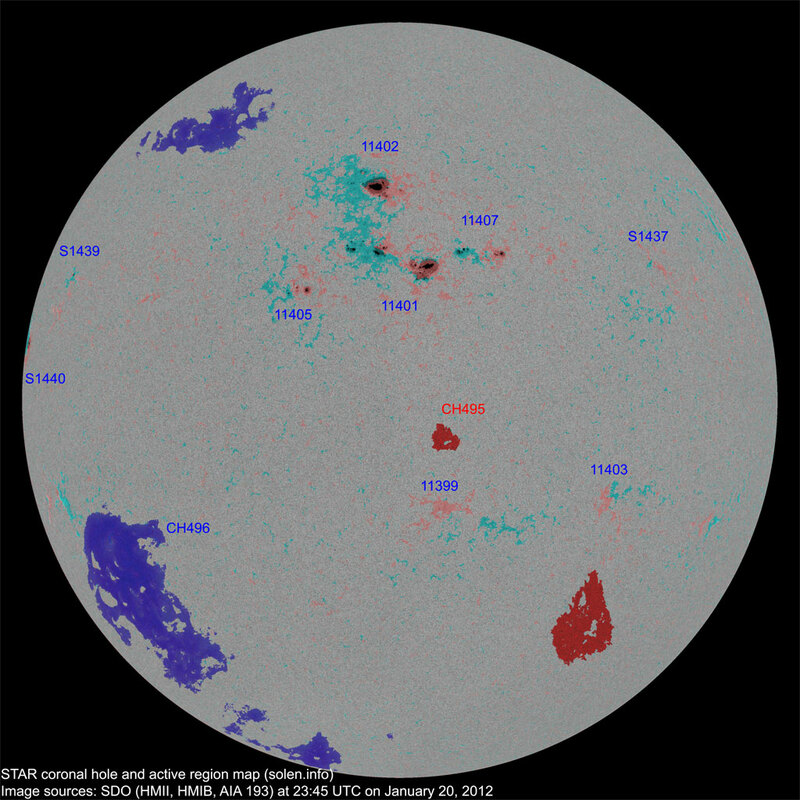 The geomagnetic field was quiet on January 20. 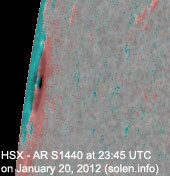 Solar wind speed ranged between 284 and 374 km/s. 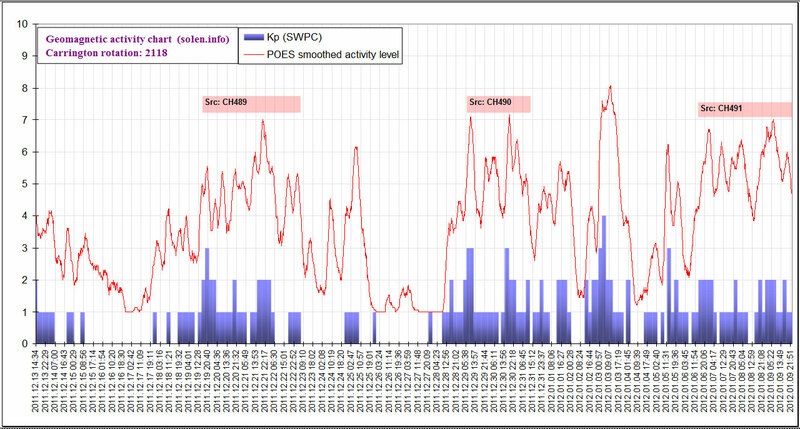 A weak solar wind shock was observed near 04h UTC at ACE on January 21. 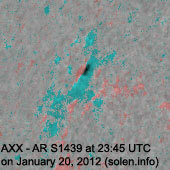 Taking into account the low solar wind speed this event may be related to the CME observed on January 16. 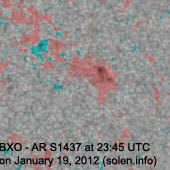 Solar flux measured at 20h UTC on 2.8 GHz was 141.2 (decreasing 1.6 over the last solar rotation). The planetary A index was 4 (STAR Ap - based on the mean of three hour interval ap indices: 4.5). 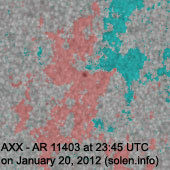 Three hour interval K indices: 11211111 (planetary), 21211211 (Boulder). Region 11399 [S22W12] decayed slowly and quietly. Region 11401 [N17W01] decayed in the trailing and central spot sections. 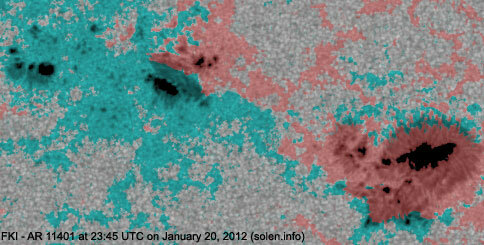 Two weak magnetic delta structures formed at the southern edge of the largest penumbra. M class flares are possible. 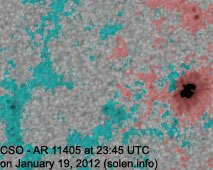 Region 11402 [N30E04] remains capable of producing further M class flares. 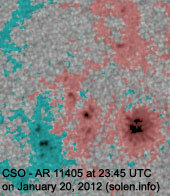 A weak magnetic delta structure is visible in the western part of the large penumbra. 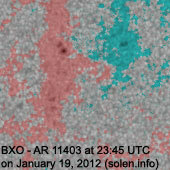 Region 11403 [S18W35] decayed further and could soon become spotless. 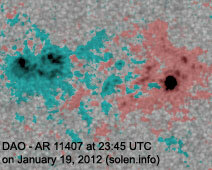 Region 11405 [N12E16] developed slowly and quietly. 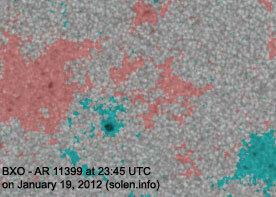 Region 11407 [N18W13] developed slowly and quietly. 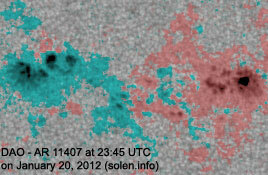 January 19: A full halo CME was observed after the M3.2 LDE in region 11402. 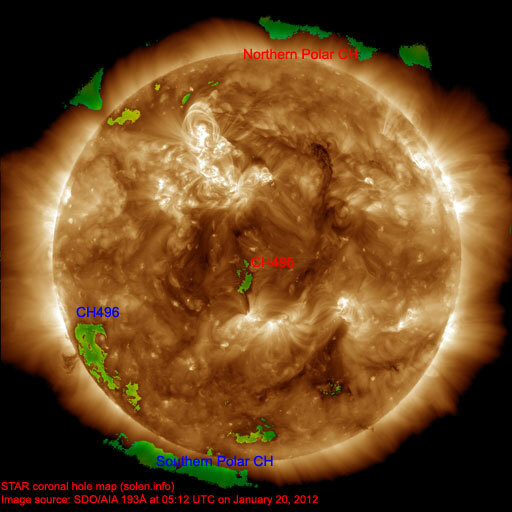 The CME will likely reach Earth on January 21 and could cause active to major storm conditions (strong southward IMF fluctuations are possible taking into consideration the magnetic layout and intensity in the area where the eruption occurred). 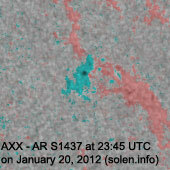 January 18: A partial halo CME was observed after a filament eruption in the southern hemisphere near the central meridian. 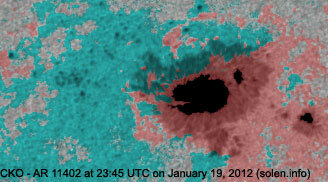 Activity increased in the filament after 08:50 UTC until eruption several hours later. 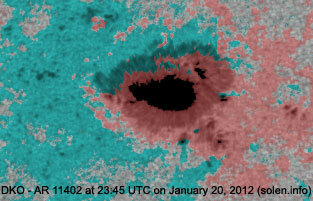 A small coronal hole (CH495) in the southern hemisphere was in an Earth facing position on January 20. A large recurrent coronal hole (CH496) in the southern hemisphere could rotate into an Earth facing position on January 24-26. Long distance low and medium frequency (below 2 MHz) propagation along paths north of due west over high and upper middle latitudes is poor to fair becoming very poor at near polar latitudes due to elevated proton levels. Propagation on long distance northeast-southwest paths is poor to fair. The geomagnetic field is expected to be quiet to active on January 21 due to CME effects, if the CME observed on Janaury 19 arrives late in the day, disturbance levels could increase to major storm. 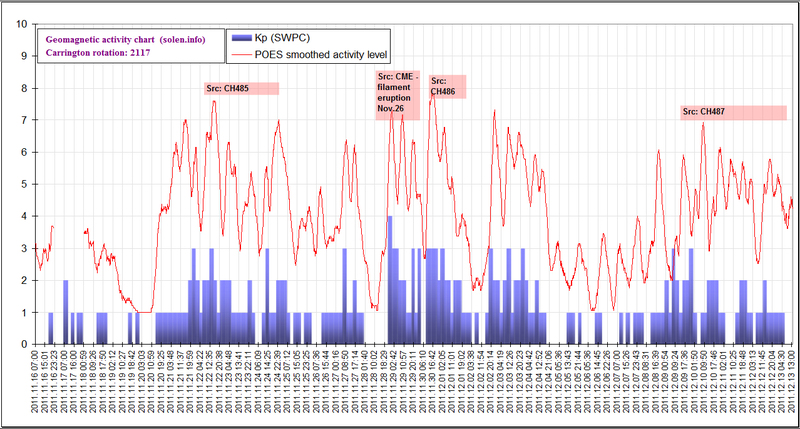 On January 22 unsettled to major storm conditions are possible due to CME effects. Quiet to unsettled is likely on January 23-24.